Copyright: LA SANTA BIBLIA, NUEVA VERSIÓN INTERNACIONAL®, NVI® Copyright 1999 by International Bible Society. Used by permission. All rights reserved worldwide. 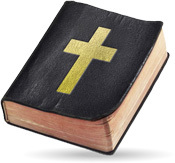 These Scriptures are copyrighted by the International Bible Society and have been made available on the Internet for your personal use only. Any other use including, but not limited to, copying or reposting on the Internet is prohibited. These Scriptures may not be altered or modified in any form and must remain in their original context. These Scriptures may not be sold or otherwise offered for sale. These Scriptures are not shareware and may not be duplicated. THESE SCRIPTURES ARE NOT PUBLIC DOMAIN.